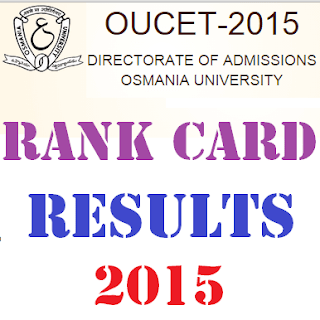 OUCET Results 2016, OUCET Results, OUCET 2016 Results, OUCET Results 2016, Osmania University Common Entrance Test, OUCET, Exam Results, Results 2016, Results Osmania University Common Entrance Test (OUCET) 2016 results are going to be released today i.e., on Monday, 29 June 2016 at 12:30 PM by OU Director of PG Admissions Director Professor Gopal Reddy, Osmania University (OU), Hyderabad at ICSSR Conference Hall, OU Guest House . Candidates, who have appeared for the exam, can check their results on the official website of Osmania University (OU), Hyderabad. Osmania University Common Entrance Test (OUCET) 2016 results were declared by OU Director of PG Admissions Director Professor Gopal Reddy, Osmania University (OU), Hyderabad at ICSSR Conference Hall, OU Guest House . Candidates, who have appeared for the exam, can check their results on the official website of Osmania University (OU), Hyderabad. The results of the entrance tests will be displayed at the office of the Directorate of Admissions, OU. The entrance rank cards of individual candidates, counselling schedules and related instructions will be made available in www.ouadmissions.com or www.osmania.ac.in which can be downloaded, and these will not be sent to the candidates directly by post. Before coming for counselling, the candidates have to download the above and take a printout of the same. In the downloaded rank card, the candidate is required to affix a latest passport size photograph (which is exactly similar to the one uploaded in the Online Application) in the space provided and get itself attested. Without the rank card, no candidate is allowed for counselling. Note: In addition to qualifying in the common entrance test, the candidates must fulfil other eligibility conditions specified for the course in which he/she seeks admission. The OUCET 2016 were already conducted. OUCET 2016 is conducted for admission to PG programs such as Master of Arts (M.A), Master of Science (M.Sc. ), Master of Commerce (M.Com), Master in Communication & Journalism (MCJ), Bachelor of Library & Information Science (B.L.I.Sc. ), Master of Library & Information Science (M.L.I.Sc. ), Master of Social Work (MSW), Master of Education (M.Ed. ), Masters in Physical Education (M.P.Ed.) etc., P. G. Diploma and five year Integrated programs for the academic year 2016. 2) You can find a link on the home page asking for “Click here to download Rank Card”. 3) You can navigate your mouse on it & click on it to get your Rank Card of OUCET 2016. 4) You will to enter your Hall Ticket number and date of birth. The eligible candidates will be admitted to various courses by centralised counselling / web counselling. The counselling schedules along with rank cards and instructions can be downloaded from OU website. The candidates desirous of seeking admission have to attend the counselling in person along with the following original certificates and two sets of xerox copies. 3. Transfer certificate (T.C.) from the Institution where the candidate studied last. If the candidate is pursuing any course during the academic year 2016 - 2016, either regular or correspondence, he/she must submit a proof of admission (certificate issued by the Head of the Institution) and will have to submit the T.C. from the present institution within seven (7) days. Otherwise the admission is deemed to be cancelled. An undertaking has to be given by the candidate to this effect. Original Certificate (or provisional certificate if the original is not yet issued as per rules) of the qualifying examination. Consolidated Memorandum of Marks of the qualifying examination. Secondary School Certificate (S.S.C.) / 10th std. certificate.